It has already been a year since the day I introduced this lottery game to my teacher. I have to say it was a pretty exciting day, since I was about to know if I was allowed to practice on such a demanding piece as a second year student. I guess I had light in my eyes when I showed it in class since she accepted. It always starts with a full report of everything you know and can notice about the object ; its provenance, its history, then the detail of every single thing you can see, even insects hole have their importance, and give you precious pieces of information. Everything must be written with precise localization of the clues. Taking as many pictures as you can is equally important; it helps one follow the evolution of the piece, and prevents from transforming the object in a way that wouldn’t respect its original state. the decorating papers were peeling off, and lack of maintenance caused them to tear. The wood presented insects holes, and the painting on metal and paper was dangerously flaky. It was observed that between the purchase of the game just after it was saved from the flood, mould percentage had increased of about 70% in a month. Also, time did its own work. The bright green of the felt faded away due to light exposure, the gold ribbons were oxidized, and it was worned out by the numerous hands that had touched it. Just as well, the horses were broken in several places, a head, a rider torso, and horse tail are missing. 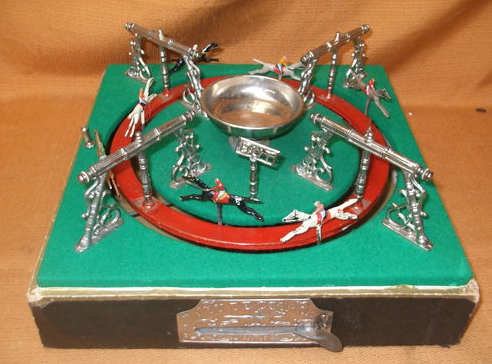 Made in the 1900s by manufacturers M.J & Cie (M.J & Co), whose history stays unfortunately unknown to me after numerous unsuccessful researches ; this game is known in french as “Jeu de Course” literally “Racing Game”, but very popular in the United Kingdom, it was mostly famous under the name of “French horse riding game”. Although Horse Riding games from this period of time are always on the model of mine, few differences can be noticed from one game to another. 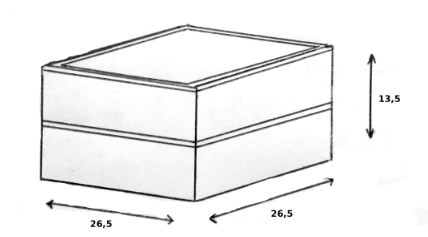 The base is in wood while the top is in cardboard. 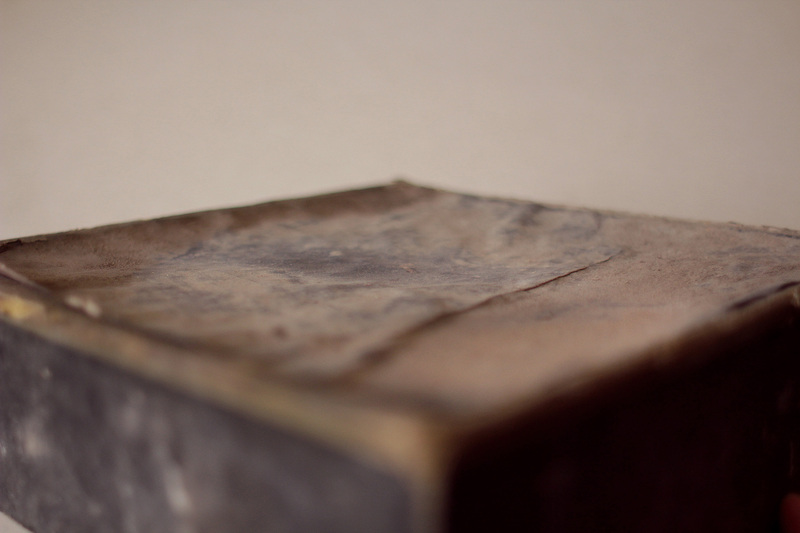 The structure is covered in black papers with golden edges, sometimes the paper is marbled with dark colors. 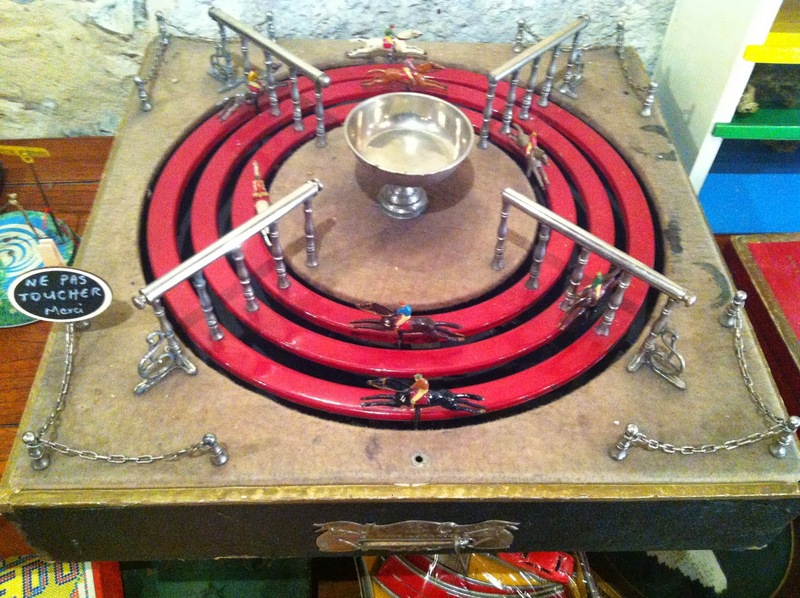 The horses are in lead while the hoops are in tinplate. There can be two, or sometimes three hoops, painted with red lead paint, the horses are painted with realistic colors and merry tints for the jockeys. I only saw games with a total of 8 horses which are numbered in white. The plateau is covered with a bright green felt which evokes the fresh lawn of the public enclosure. A french flag announces the end of the race, though it is missing on my game. A plaque announcing the manufacturer shines on the front of the base, on which is the trigger to start the mechanism up. My version of the game measures 5,3 inches in height, and is 10,5 inches wide and in length since it is a perfectly square base. Some games are bigger than others, depending on the number of hoops. Here are a few illustrations I did for my dossier, let me know if you want any translation of the keys. The large metallic plateau (C) covered with green felt (billard-like), is fixed in the wooden structure. The wooden structure is covered with golden papers on the edges, and black paper on the main part. 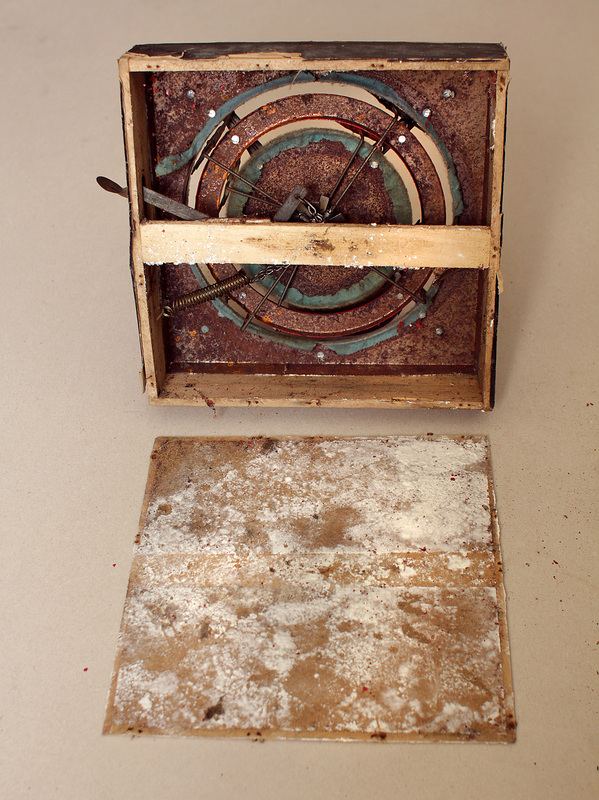 It encloses the box at the bottom and hides the mechanism by holding a cardboard square. Pilasters are screwed three by three from the angles of the larger structure to its center, four on (C), four on (A) and four on (B). Pilasters hold the red ring (B) as such : a metallic (lace-like) piece pierced in three parts goes on three pilasters at a time, and is secured by a small spear that goes through tiny holes on top of the pilasters. Two horses roundabouts (7) run between (A) and (B), and the other (9) between (B) and (C). They are actionned by a simple mechanism : when you pull out the outside lever, a spring is actionned and drags a gear down the main pole. It comes back when you let go of the lever and makes the mechanism follow. Flower-shaped gears and washers are placed in-between the base of (7) and (9). The cup to place bets (1) is pierced and maintains with nut (2) and bolt (3) the main pole (6) that goes through the central fixed plateau (A). It is levelled by a decorative “cone” (5) and washer (4). 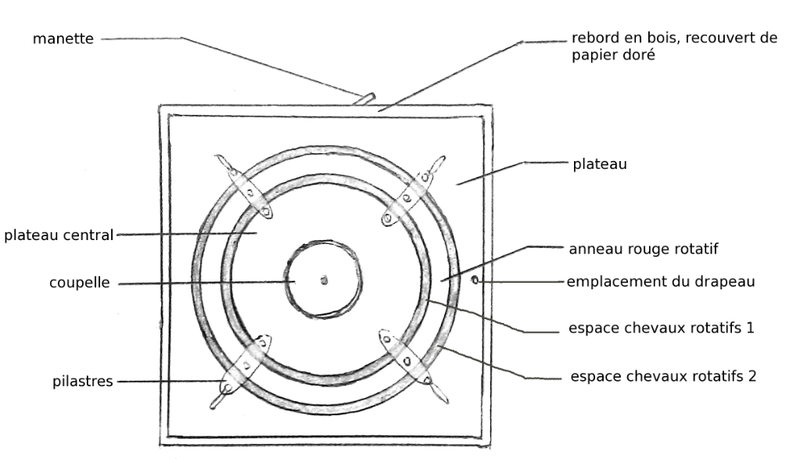 hi Ségolène, about the picture of “the Cross-section of the mechanism”. What are the meaning for the numeric and letters? do you have more “maps”? am thinking i build one, since i can’t find one. Hi Domingo ! Thank you so much for passing by and for your comment ! I did not include the legend because they were in french, but that was silly, I will change that in the article at the moment so you can find them at the bottom. It is a simple mechanism really that only works with springs triggered by a “latch”. 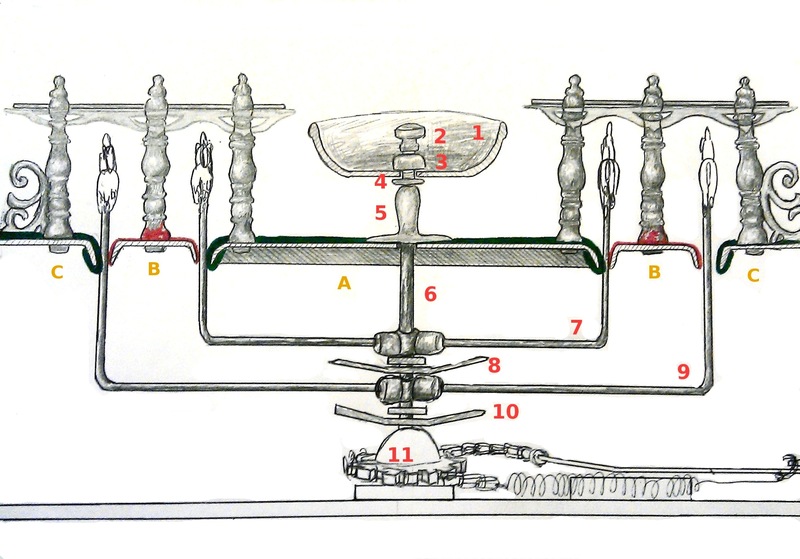 Sadly I did not make other drawings, but I think the mechanism is quite simple to copy ! I may have a few more pictures of the guts if you write to me through my website contact form http://segirardco.com . If you encounter trouble, maybe you can ask Nico, the blog owner if she can give you a tip ? She is rather busy though, but I am sure she would be glad to offer her help when she have the time. Otherwise, I believe you already know how to do these things if you are asking…. Here are some links where you can buy Horse Racing Games, but they are really damaged, and as a conservator I would try to dissuade you to try to repairs them, as it would damage them further with inappropriate materials 🙂 Good luck with your project, please keep us tuned if you give a go to creating your own ! My ! I am very happy to know that I could help someone ! Hello! 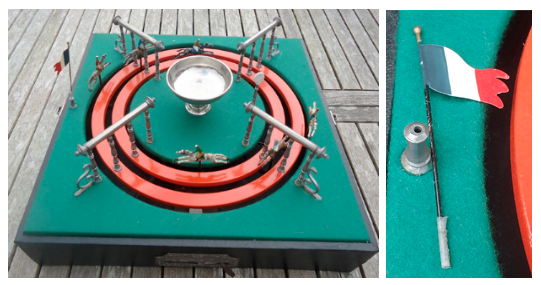 I purchased an antique jeu de course game for my husband, fortunately in much better shape than yours above! 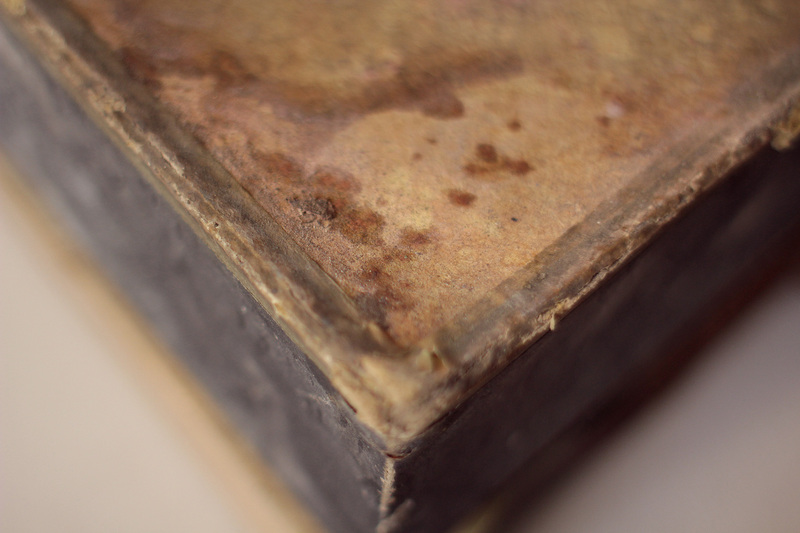 However, we would love to have it restored but cannot find anyone who wants to touch it. Is this something you would be interested in quoting for us? We are in Houston, Texas, by the way. Hello, this is a great purchase ! And I am so grateful of you to contact me. Unfortunately, I proceed in France… I would have loved to restore it for you though. I saw one of these in Charleston SC about 20 years ago in an antiques shop…I have regretted not buying it ever since. Wonderful toy. Hello Philip, thank you for this comment. I have been very grateful indeed not to report this purchase for later, everyday since I bought it. You might come across some others as I did ! Although they are very expensive when they are in good state, and not as charming due to very bad restoration sometimes. I did my best for this one and I hope my work will be approved by professionals and amateurs.